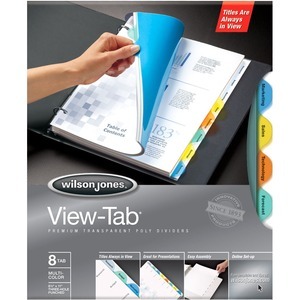 View-Tab® Transparent dividers have transparent polypropylene tabs that let you print all tab titles on one standard sheet of paper; no more tiny inserts. Choose from five or eight count tab sets, round or square shape, clear or multicolor set. Online templates available at wilsonjones.com/templates.